A crew of seniors enjoy jet skiing from Boston Harbor Marina. Here they have reached Poulsbo where they will shop and enjoy a nice meal before heading home. If you kayak or paddleboard, you get a challenging workout in close proximity to the water. Sitting on a motorboat offers an up-close view of a marine setting. Speed is increased and physical exertion is decreased. So what activity combines the on-top-of the water experience and physicality of a kayak/paddleboard, and the speed of a motor boat? The answer – jet skiing. 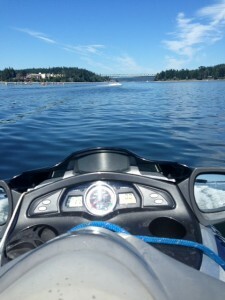 A personal watercraft that has been in use commercially for over forty years, the jet ski has developed a following in the South Sound area over the last few decades. 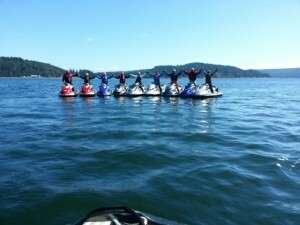 Jet skiiers explore local waterways and destinations across the Puget Sound area. 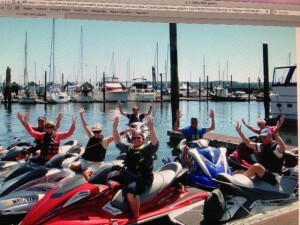 In the late 1990s, Olympia native John Clees, a retired CPA who now practices law with the Worth Law Group in Tumwater, received a Sea-Doo from his wife Sue as a gift on Father’s Day. Fast forward to 2013, where John and Sue are now joined by around 15 other jet ski enthusiasts on rides throughout the year. Past destinations include Seattle, Bremerton, Bainbridge Island and Anacortes. Living on the water on Eld Inlet, the couple have been involved in boating and water sports for a significant period of time. However, long distance jet ski journeys were not part of their reportoie initially. Before a long distance ride, the group will meet at Boston Harbor Marina, where some group members keep their vehicles docked or stored. Then, it’s a straight line trip to their destination, which is really only part of the journey. While many people associate jet skiing with a younger generation, nearly every member of the group, which Clee’s says is referred to as “The Pod” or “The Killer Bees,” is over the age of 65. The youngest members are Dallas and Cindy Puckett, the owners of Valley Nut and Bolt in Tumwater, who are both 59. The longest trip ever undertaken by the group was to Deception Pass, an area known for its beauty and unpredictable weather at times. “It was so foggy and the water was huge,” said Jan Smith of the trip to the La Conner area five years ago. While water conditions can end or postpone a trip quickly, the majority of the group rides are accomplished fairly easily. For members of the group, the close proximity to the water and surrounding scenery separate jet skiing from other water sports. For the Smith’s, jet skiing is not just about personal enjoyment. It’s also a main source of transportation to use to run errands. “We can go ride to Budd Bay, go to the Olympia Farmers Market, pack up our items and head back home,” said Jan Smith, who along with Burt, is a pastor at the Church of Living Water. The group continues to look for new destinations to travel to, and during the summer season, Clees estimates he makes around 25 trips with his wife and or the group. This past August, Sue and John explored the Hood Canal area for the first time after dropping in at Union. 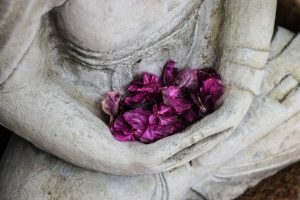 Regardless of where the trip takes the group, they will be experiencing the journey together and continuing to develop their long standing friendship.